In the end there were no maps of Grenada to be had anywhere at Fort Bragg. In an inspired moment a division staff officer headed for downtown Fayetteville, where he procured tourist maps of the island. Planners superimposed a military grid atop the map and distributed copies to the invading troops before they boarded their air craft. Interestingly, many senior leaders were relying on articles copied out of The Economist for the most up-to-date intelligence on the island. Grenada lies between Puerto Rico and Venezuela and was an unlikely location for a showdown between the Western democracies and communism. Yet, it was on the small island that the Brezhnev Doctrine—in essence that the Soviet Union would ensure that any government that became communist would remain so forever—met its first reversal. At the end of a three-day battle Grenada would return to the family of democratic nations. Moreover, the fight set in motion forces that fundamentally changed American military operations. Grenada had a long and bloody history well before the American invasion. The centuries following the island’s 1498 “discovery” by Christopher Columbus were marked by rebellion and a British-French power struggle. Britain finally granted the island independence in 1974, ending more than 300 years of colonial rule. For the next five years Prime Minister Eric Gairy, supported by vicious political “mongoose gangs” (so named because they initially came together in a government program to eradicate the island’s mongoose population), ruled the country. That rule ended in March 1979, when Maurice Bishop, head of the Marxist New JEWEL (Joint Endeavor for Welfare, Education, and Liberation) Movement, or NJM, staged an armed coup while Gairy was in New York trying to persuade the United Nations to conduct research on extraterrestrial life and UFOs. Many Grenadians welcomed the coup, although the new regime—the People’s Revolutionary Government (PRG)— soon proved as corrupt and vicious as Gairy’s. In a bid for financial support and to enhance his own security, Bishop closely allied himself with Cuba. In turn, the Cubans sent a military mission to help train Grenada’s new People’s Revolutionary Army (PRA) and People’s Revolutionary Militia (PRM), using weapons provided by the Soviet Union. Cuba also sent men and materiel for the construction of an international airport at Point Salines, the island’s southwestern tip. A 650-man Cuban army workforce toiled to complete the runway by March 1984, the revolution’s fifth anniversary. By 1983, however, the PRG was splintering. An opposition group led by Deputy Prime Minister Bernard Coard determined that Bishop’s ideological beliefs were insufficiently pure and began plotting a takeover. As the factions moved toward a showdown, Bishop had popular backing, while Coard held the loyalty of the military. Despite the presence of armored personnel carriers and soldiers, the crowd freed Bishop, Creft and the other ministers and spirited them to the army’s headquarters at Fort Rupert, a mile and a half away. This journey took Bishop and his supporters right past Coard’s residence, where he crouched, defenseless, waiting for Bishop’s retribution. It never came. For reasons unknown, Coard was allowed to remain unmolested and able to regroup —a mistake Bishop would soon regret. As Bishop and his advisers met at Fort Rupert, Coard and the PRA stormed the installation. Three armored personnel carriers plowed through the thousands of Grenadians gathered to hear Bishop speak, killing scores of them. Within minutes the insurgents had taken the fort and re-arrested Bishop, Creft and the other four ministers. Learning from past experience, Coard ordered the prisoners’ summary execution. He then sought Cuban support for his coup. But Fidel Castro had considered Bishop a personal friend and refused additional aid. Coard then turned to the Soviet Union, with whom he was more closely aligned than Bishop. However, despite having sent military materiel, Moscow attached little strategic importance to Grenada and deemed such direct intervention in America’s backyard too great a risk. Realizing he was a liability to the Marxist cause, Coard resigned his position. Panicking, the new regime imposed a 24-hour “shoot to kill” curfew on the island and broadcast pleas for unity under the revolutionary motto “Forward Ever, Backward Never.” The Revolutionary Military Council was playing for time. The most compelling reason for the United States’ keen interest in Grenada was geopolitical. There was growing unease in American policy circles about the wisdom of allowing the Cubans and Soviets to create a satellite so close to vital shipping lanes. These concerns intensified as it became clear the Soviets were supporting communist movements in nearby El Salvador and Nicaragua. Taken together, Cuba, Nicaragua and Grenada enveloped the Caribbean in a strategic triangle, through which half of any U.S. wartime reinforcements to NATO would have to pass. What put Washington policymakers on high alert, however, was the start of construction on a new airfield capable of handling the largest Soviet military transports. The Reagan administration doubted Grenada’s claims the field was meant solely to support tourism, as there was no concomitant building of the hotels and resorts one would expect to accompany such an initiative. Once completed, the airfield would give the Soviets a forward base in an area the United States considered vital to its security. The growing political chaos in Grenada thus offered Washington the opportunity to return one small nation to the democratic fold, while at the same time restricting the expansion of Soviet influence in the region. Moreover, Grenada offered the U.S. military a chance to bolster its reputation, which had suffered with the withdrawal from Vietnam, the humiliating failures during the 1975 Mayaguez incident and the failed 1980 Iranian hostage rescue. The latter debacle had particular resonance: By 1983 more than 650 American students were enrolled in Grenada’s St. George’s University School of Medicine. Although there was no initial threat, the specter of the Grenadian government holding hundreds of American students hostage haunted Reagan and his cabinet. It was this threat that provided the incentive for rapid action on what became a rescue mission—it was never officially referred to as an invasion. Planning for Operation Urgent Fury picked up speed on October 19, when Milan Bish, the State Department’s ambassador in Barbados, reported to Washington that the United States “should now be prepared to conduct an emergency evacuation of U.S. citizens in Grenada.” Within days the final directive was ready for presidential approval. It called for ensuring the safety of American citizens, restoring democratic government on Grenada and preventing Cuban intervention, and it authorized a full-scale, joint-forces invasion conducted with the participation of the Organization of Eastern Caribbean States. Such a mission appeared to require, by law, the consent of Congress. But since a hostage rescue demands complete surprise, the Reagan administration had a handy excuse for skirting the War Powers Act and keeping Congress in the dark until the operation was under way. 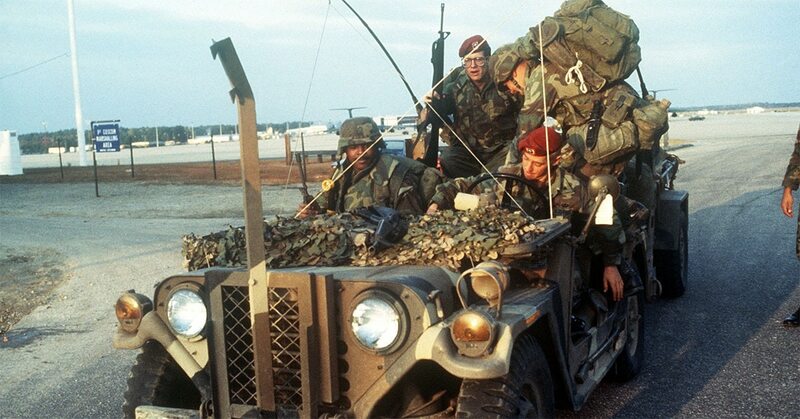 The U.S. Joint Chiefs of Staff handed Operation Urgent Fury to Vice Admiral Joseph Metcalf III’s Joint Task Force 120, which comprised the 22nd Marine Amphibious Unit, the Joint Special Operations Command and the 82nd Airborne Division. Since the invasion was precisely the kind of mission for which special operations forces trained, JSOC played a leading role from the start. Its Task Force 123 included Army Ranger battalions and Delta Force operators, Navy SEALs and Air Force Combat Control Teams. Major General Norman Schwarzkopf Jr. was pulled from command of the 24th Infantry Division and made Metcalf’s senior Army adviser. Metcalf’s newly formed JTF 120 had less than four days to finalize the Grenada plan and launch the operation. Doing so meant overcoming such obstacles as the lack of military maps or on-site intelligence and the fact that none of the units involved had previously planned or trained together. The final outline called for the invasion to commence at 2 a.m. on October 25. TF 123 would take the southern end of the island, with the Rangers parachuting onto and securing the Point Salines airfield, then moving on the Calivigny barracks and True Blue campus of the medical school. The SEALs and Delta troops would handle the area around St. George’s, while the Marines were to land in the north and secure Pearls airfield. All of these objectives—including the safe release of the medical students and Commonwealth Governor-General Sir Paul Scoon—were scheduled for completion within four hours of the initial assault, at which point the 82nd would land at Salines and restore law and order. 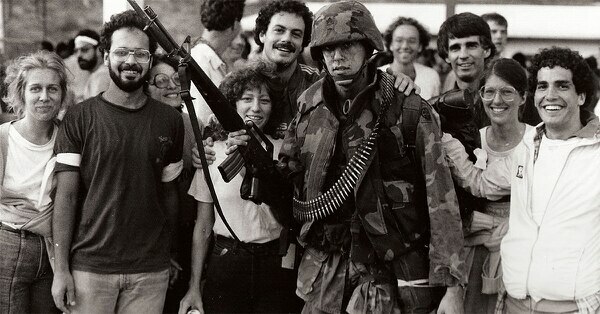 If all went as planned, the Americans would then hand over peacekeeping duties to a Caribbean force and head for home. In the predawn hours of October 24, 12 Navy SEALs and four Air Force Combat Control Team members parachuted into dark Caribbean waves whipped by 25-knot winds. The men were supposed to clamber aboard two air-dropped Zodiac inflatable boats and slip ashore at Salines airfield to position aircraft beacons for the next day’s Ranger drop. The mission was plagued with mishaps. On hitting the water, four SEALs drowned. The remaining men piled into one boat, but were forced to kill its engine when a Grenadian patrol craft approached. The engine failed to restart and the SEALs had to wait for rescue by a surface vessel. The operation was only two hours old, and already the first force deployed had failed in its mission and suffered 25 percent casualties (it was later revealed the SEALs had never trained for the mission they were assigned that night). Unwilling to postpone the invasion, Metcalf decided to resend the SEALs the next night and move the Ranger drop to just before daybreak, though it would cost them the cover of darkness. Once again, however, the SEAL team failed to make it ashore. Unable to wait for the SEALs to get through, at 5 a.m. the Marines launched a heliborne assault on Pearls airfield, encountering little more than token resistance. Within two hours they had overrun all of their objectives. Things did not go as smoothly for the Army. Newly obtained aerial photos showed obstacles on the airfield—something the SEALs might have cleared had they landed. Presuming the enemy was anticipating the assault, the Ranger commander decided to jump at 500 feet in order to minimize his troops’ time in the air. Such a low-level jump made reserve parachutes useless, so they were discarded. 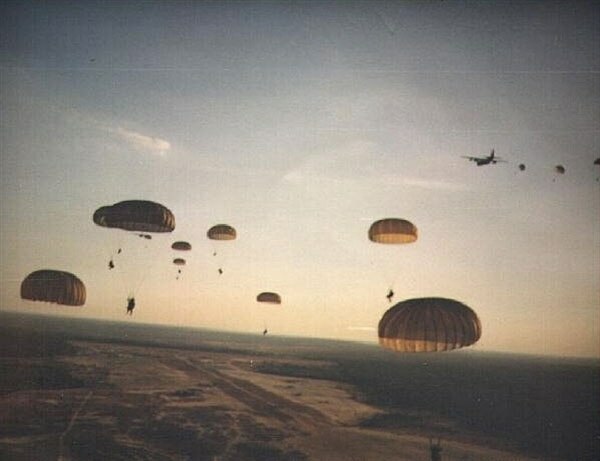 Worse, only the first assault company had expected to jump, so only they were wearing parachutes. At the last moment the rest of the Rangers scrambled to get into their harnesses, a task made infinitely more difficult when attempted in an aircraft crowded with men and equipment. As a result, the Rangers began landing more than 30 minutes behind schedule, and the successive drop waves took 90 minutes to complete —in daylight and initially under heavy enemy fire. So far, Urgent Fury was a perfect example of how not to conduct an airborne operation and was shaping up to be an unmitigated disaster. By sheer luck and despite all the mishaps, the Rangers had lost only one man. They soon cleared the airfield, opening it for the 82nd Airborne to begin landing troops and equipment. Grenadian forces mounted a late-afternoon counterattack with three armored vehicles, but defenders with antitank weapons and an orbiting AC-130 gunship stopped them cold. Still, both the Rangers and the 82nd troopers met surprisingly stiff resistance, prompting ground forces commander Maj. Gen. Edward L. Trobaugh to order Fort Bragg, “Send me battalions until I tell you to stop.” He also received permission to retain the Ranger battalions, which were to have departed when the paratroopers arrived. As the 82nd continued to expand the airhead, two companies of Rangers setting off to rescue the students at True Blue campus encountered heavy fire from hilltops around the runway. Although Marine attack helicopters eventually silenced the enemy positions, it was a frustrating process, as the Rangers and the Marine aviators were operating on different radio frequencies and using different maps. While this was being sorted out, one forward air controller resorted to using a mirror to designate a target. As the Rangers approached True Blue around 9 a.m., most of the students were hiding in their rooms. A firefight between the PRA guards and the Rangers raged for about 15 minutes before students heard American voices ordering them to come out. The soldiers gathering the students were startled to find less than half the expected number. It was then they learned, for the first time, that 200 students occupied a second campus at Grand Anse, a few miles to the north. No plans were in place for evacuating that campus, and a telephone call confirmed it was surrounded by PRA forces. In the meantime, another team of SEALs had fast-roped onto the roof of Governor-General Scoon’s mansion, rescuing him, his wife and the staff. The insertions was flawless, the extraction less so. A PRA counterattack pinned down the SEALs for what became a 24- hour siege, during which enemy forces downed two supporting Marine AH-1 Cobra helicopters. Unable to communicate with circling AC-130 gunships, an enterprising SEAL found a phone booth and used his AT&T calling card to contact Fort Bragg. From there he was patched into the aircraft frequencies and was able to call down devastating fire on advancing PRA forces. These strikes kept the enemy at bay until a Marine force fought its way to the compound the next morning. A separate JSOC mission failed to capture the transmitter broadcasting the government-controlled Radio Free Grenada, after PRA counterattacks drove a SEAL team from the position. Similarly, Delta and Ranger assaults on the enemy command posts at Fort Rupert and the prison at Richmond Hill stalled after antiaircraft fire downed two helicopters and damaged others. Adding some macabre mockery to the unfolding spectacle, attacking U.S. aircraft accidentally hit a mental hospital, killing 18 patients and setting others free to aimlessly wander around a nearby town. By dawn on October 26 the situation on the ground was perilously close to a debacle. But American might was finally turning the tide. With the governor rescued and Fort Frederick taken, the Army’s priority turned to rescuing the students at the Grand Anse campus. Cuban troops had already ambushed two reconnaissance patrols, killing two Americans and wounding six others. But as each battalion of the 82nd landed, the weight of the U.S. advance increased. The battalions ground forward, uncovering huge warehouses full of Soviet and Cuban military equipment as they progressed. The Americans fended off another Cuban assault near the warehouses, with no U.S. losses. As the advance was proving slow and fitful, senior commanders decided to take Grand Anse by heliborne assault. Since no Army helicopters were available, Schwarzkopf, an adviser with no command authority, ordered six Marine CH-46 Sea Knights to drop the Rangers. The assault force soon accomplished the rescue, meeting only minimal enemy resistance, although one helicopter crashed after its blades hit a palm tree. Left to fend for themselves, 11 of the Rangers retrieved a rubber raft from the downed helicopter and paddled out to a waiting destroyer. Remarkably, only after this engagement did the military learn there were yet more students near Prickly Bay, just east of Point Salines, requiring a third rescue mission. By October 27 the U.S.-led forces had consolidated their gains and focused on clearing the island. Enemy resistance rapidly collapsed, and the Grenadian people welcomed the Americans as liberators and helpfully pointed out Cuban and PRA members disguised in civilian clothing. One final mishap occurred when a Navy A-7 Corsair accidentally strafed the 82nd Airborne’s 2nd Brigade command post, wounding 17 soldiers (one of whom later died). Of the original target list, only one remained untaken—the PRA barracks at Calivigny. As there was no tactical imperative to take the barracks immediately, Trobaugh planned to launch the assault early on October 28. When the Joint Chiefs instead ordered it done before nightfall, Trobaugh handed the mission to the Rangers, who were already at the airfield awaiting redeployment to the States. Despite intelligence that a battalion of PRA soldiers and 300 to 400 Cubans manned the barracks, the Rangers were given just minutes to plan the assault. As the assault team’s six Army UH-60 Black Hawk helicopters approached the barracks, they encountered none of the expected anti-aircraft fire. Nevertheless, small-arms fire hit one of the Black Hawks, which became entangled with another, causing both to crash. Miraculously, no one was killed. A third UH-60, however, veered to avoid the crash and landed hard in a nearby ditch. The pilot, unaware his tail rotor had been badly damaged, attempted to take off and spun out of control. The flying debris and rotor blades chopped three Rangers to pieces and badly injured five more. As medics dashed in to help the wounded, the remaining Rangers stormed the compound. They found only a handful of PRA soldiers. The rest had abandoned the barracks several days before. The invasion force spent October 28 mopping up the rest of the island and collecting the almost 200 university students who lived off campus. In all, the U.S.-led forces rescued 581 American students and more than 100 other foreign nationals. The Americans started turning over peacekeeping responsibilities to the Caribbean force on October 29. By December 15 no U.S. troops remained, and Scoon installed an interim government that held democratic elections a year later. Despite hasty planning, inadequate intelligence, dismal co- ordination and catastrophic equipment failures, Operation Urgent Fury was judged a success. The U.S.-led forced had seized the island, rescued the students and, not least, thwarted Soviet and Cuban influence in the Caribbean. Regardless, the operational missteps forced the Department of Defense and the individual branches to do a serious analysis of their joint doctrine and capabilities. Clearly, poor equipment interoperability and the lack of joint training had jeopardized the mission. Congressional hearings on those issues ultimately led to passage of the 1986 Goldwater-Nichols Department of Defense Reorganization Act—the largest shakeup at DOD since its 1947 inception. The act consolidated the power of the chairman of the Joint Chiefs and created truly synchronized forces that in combat could be unified under a single commander. Never again would the services train, plan or procure equipment in isolation. What had been a minor three-day skirmish thus had far-reaching effects that still serve American soldiers in combat. Lt. Col. Sharon Tosi Lacey serves at the U.S. Army Center of Military History and is author of the upcoming Pacific Blitzkrieg: World War II in the Central Pacific. For further reading she recommends The Rucksack War (2011), by Edgar F. Raines Jr., and Urgent Fury (1989), by Mark Adkin. Originally published in the July 2013 issue of Military History. To subscribe, click here.